Carla Maria TURELLI, our Sister Marie Gianfranca, was born on February 21st 1918 in Marone on Lake Iseo in the diocese of Brescia. Her devoutly Christian family was sorely tested: at a young age our sister lost her father. During the Second World War, her mother was killed, accidentally machine-gunned on a boat with a group of people crossing the lake. Then she lost her brother, who came back sick from the battlefront. As a young girl she was very committed to Catholic Action before entering the congregation of the SMSM at the age of 31. She made her religious profession on September 8th 1951 at Ste Foy-lès-Lyon. After this commitment, the General Council appointed her as Mistress of Postulants at Bedizzole, which was the first house of formation in Italy. 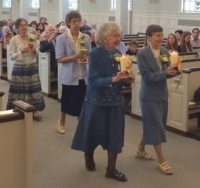 She stayed there until her perpetual vows in 1957. In October 1957, she received her mission assignment for New Caledonia. Embarking at Marseille on October 29th 1957, she arrived on the “Grande Terre” on December 12th 1957. She began at Saint Louis. 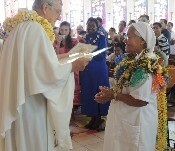 Then, in June she was assigned to Our Lady of the Missions in Noumea to replace Sr Marie Norbert who was sick. How many soutanes did she not measure and sew for the seminarians and Marist Fathers? In 1963, she was destined for the Foyer Massabielle to serve at this hostel for young workingwomen for three years. In 1978, she was called to Rome to look for a house for the General Council; with some difficulty, she finally found Via Cassia the place that we have now. During the following years until 1984 Sr M. Gianfranca served as the financial administrator for the Province of Oceania; provincial councilor and house coordinator for the General Chapter in Rome in 1987. She also helped the bursars in Wallis-Futuna and Vanuatu by her visits to these islands. On her return from a holiday in Italy, she gave service in community at Vallée du Génie, St Louis, Mont-Mou and Rivière Salée. 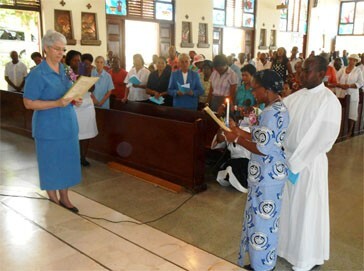 Always discrete, she participated in Catholic Relief services and in the life of the ecumenical parish at Rivière Salée. An indefatigable worker, S.M. Gianfranca was appreciated in her role as a teacher of the youth and the women. Well known by many people, she drew on a network of solid friendships from near and far. Many people came to ask her advice and to find hope again. Her joy in her mission remains in our memories. She confronted difficulties with her fighting spirit. Having no fear of responsibilities, she gave directives, knowing at the same time how to question herself, recognize her mistakes and recommit herself to collaboration. She always had a great spirit of faith and a fidelity to her life of personal and community prayer. 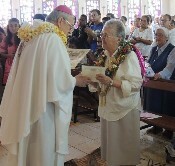 In 2002 her health problems were increasing and she was assigned to the house for senior sisters at La Foa, then in 2007 to Nazareth, Rivière Salée. Her health was diminished and walking was difficult, but she courageously continued to prepare the “Hope” leaflets that are distributed in the hospitals and clinics every week. 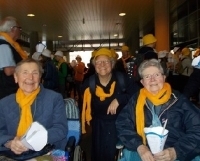 In November 2010, she broke her femur and from that time she was hospitalized in the geriatric unit. She came back to the community for one month, and then returned to the hospital where they discovered an advanced cancer of the colon. On the night of April 14th, the Lord called her, on her bed at the Gaston Bourret Hospital. Several hours earlier, she had received the sacrament of the sick and communion. On September 8th, she would have celebrated her 60th jubilee in religious life. 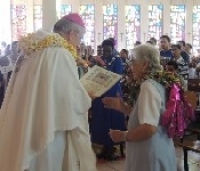 Sr Marie Gianfranca, thank you for this life of fidelity in our Congregation and in the diocese of New Caledonia.